All instruments used without amplification or other electronics. This trio has been one of the finest improvising groups around since its formation in 1984. It has not been a full time group, as each of its members also performs in various combinations with a plethora of other musicians. However, every time it does get together, it produces music of the highest order. This is the third published recording of the trio (as a trio without other musicians, that is). The previous ones were CONCEITS (ACTA LP 1) recorded in 1987, and CONCERT MOVES (Random Acoustics CD 011) from 1991 and 1992, so a new recording is overdue. Comparison of the three releases would seem to suggest that the music is getting sparser, and almost sedate. Paradoxically, it is also getting more playful, with more risks being taken now that the group no longer has to prove itself. An example of this is CLIMATE CHANGE - a complete piece recorded at a Mopomoso gig at the Red Rose in London. The atmosphere was highly strung immediately before the music started, resulting in a considerable amount of tension on the stand. In many bands, this situation would result in the musicians trying to outplay each other. Instead, these musicians appear to be under-playing each other - an extreme example of a way of working that was developed by others over thirty years ago. The rest of this CD is taken up with the trio's superb appearance at the Musique Action '98 Festival in Vandoeuvre-les-Nancy a few weeks later. The first two pieces performed, HEAVY MERGE and BELAYED, are included here complete, and can be said to be textbook examples of how three strong individuals can improvise as a group. They are also, perhaps, definitive performances by this trio. The third piece showed another approach often used by the trio - a sequence of four short improvised duos and a solo. Most of these are heard here as BUFFET BALLS. The fourth and final piece of the set is just represented by its ending - BEYOND HEADLINES. The music included here from these two concerts goes to show that this trio is as good as ever, if not better. One looks forward with confidence and anticipation to further performances of at least the same excellence. "Butcher, Durrant and Russell form one of the key free improvising trios on the London scene. Uncompromisingly committed to making the music count in the moment it's being made, it's good to hear them recorded so well in a live setting. While a studio recording might capture the details of this extremely delicate music, players like these rise to the occasion of a gig by pulling out the stops and investing in every gesture. The adrenaline and highly focused concentration are almost palpable in these five, mostly long, improvisations. Butcher is quite simply one of the most advanced saxophonists on the planet, both technically and aesthetically. You can hear many, many young players trying to use the sounds which are his stock-in-trade, with ungainly and sometimes even embarrassing results. It is by no means easy to create the controlled, thoughtful music Butcher creates using overtones, false fingerings, reed sounds, breath sounds, key noises and the rest. There is a jazz connection here, of course, but stronger with Butcher is the New Music influence, in the work of Bartolozzi and the like, who sought to extend woodwind sounds to enrich the composer's palette. Butcher's improvisation really is spontaneous composition, too, because he gives careful weight to every idea, making a compelling argument out of his music rather than moving from episode to episode as so many improvisers are wont to do. Durrant compliments Butcher well, and it's no surprise that these two are often found playing together in a variety of groupings. Unlike many players, Durrant seems to have completely abandoned the idea that group improvisation is some kind of competition. Instead of trying to be the profoundest, most dazzling or, if all else fails, loudest member of the group, Durrant works with Butcher to create true group interplay. That's why he's often overlooked as a player - it is quite possible to see him play nothing but a few quiet, bowed notes in a whole piece. Understated where he needs to be - but not shy of his instrument either - Durrant is a great partner for Butcher and, what's more, they seem to understand one another perfectly. Russell, by contrast, plays guitar as if he's never seen one before in his life, as if he were exploring its potential for making sounds all the time. Eschewing conventional technique almost entirely (much more than either of his partners does), he scratches, rattles and clicks through his music. This is hard to follow at first, but his contribution soon shows itself to be most valuable. Working much like a percussionist, he nevertheless avoids trying to punch home accents (there aren't any, really) and goes for pure texture. The result - and especially his work with Durrant - is surprising and successful. This is an excellent session of undiluted British free improv by some of the best in the business (if you can call it a business, that is). Listeners who are unfamiliar with the work of any of these players, or with the genre as a whole, are encouraged to start here. Initiates will already know that this will have to go on their shopping lists without delay." "The trio takes several different tacks in their view of group improvisation. A performance like Heavy Merge finds them creating slowly evolving music where texture seems more important than specific notes, frequently blending the resonating, nearly transparent timbres of blown tenor sax and bowed violin in contrast to the prickly, quickly decaying guitar notes. To change the timbral relationships, Butcher switches to percussive reed sounds and Durrant to short staccato or pizzicato. When Butcher plays soprano sax, he tends to play more melodically, so a piece like Belayed has for a time a recognisable ballad feel, which ultimately disintegrates into a web of non-pitched sounds, low dynamics, and minuscule gestures. One can sense that their music-making is an active engagement in an ongoing process, even including the occasional agreement on an unrelated, random simultaneity à la John Cage, and that we are merely eavesdropping upon their private work. For the most part, this trio's music is sotto voce, an almost fragile mosaic of sounds under continual readjustment." " THE SCENIC ROUTE comes with an announcement that all instruments were used without amplification or other electronics, and that's useful information, given that the trio play music that is 'electronic' in the extreme, reminiscent in some ways of musique concrète and other forms of electro-acoustic music. If only because of the saxophone's sonic breadth, one tends initially to hear Butcher as the music's central event, each note and pad slap and oscillator-like mix of tones given air and resonant life. But as this programme goes on, and as one listens to pieces repeatedly, the unity of this trio becomes more apparent and more acute. Durrant's high speed tremolo bowing and Russell's advanced art of string scratching are every bit as electric in their effect, as if tremolo or scratch or plucked arpeggio has become as ideally abstracted as the turning of a knob or the blending of frequencies with a bank of oscillators. There is no illusion in this process of real-time music making, yet illusion arises everywhere. Thus Butcher's purely sonic approach leads to the impression that his soprano is a flute on both Belayed and Beyond Headlines, a shakuhachi on Climate Change. Similarly, instruments like the pipa and koto seem to live inside Russell's guitar, while Durrant gives an account of the higher frequencies of world bowing. There is in this playing a mix of the intimate and the abstract which may be the ultimate hallmark of the best of the British school of improvisers and which ultimately distinguishes it from any electronic music that I have heard. There may be a hint here that electronic music points further into the physical properties of acoustic sound production, for it is the overwhelmingly human qualities of this music that ensures its life - both its sense of the subjective interior states and its rare definition of community." "The third recording from this greatly under-appreciated trio continues where the brilliant CONCERT MOVES (Random Acoustics) left off. Having now worked together, on and off, for the past two decades, the character development has been established, leaving these three free to concentrate on the plot. Drawn from two separate concerts, this disc nevertheless, feels like a cohesive group statement; an updated work in progress, as it were, of a distinct approach to improvisation. While all three players are formidable soloists in their own right, drawing attention to this seems to be the antithesis of their collective experience. Instead, the music drifts with deliberation from one voice to another, as each player interjects a line or fragment into the overall shape. The music is marked by the subtlest of gestures. A barely audible assertion from one player may lead to another exploring that area for a moment, or perhaps just as easily flowing into another statement entirely. The whole thing plays out unassumingly enough, but more likely it is a daft eccentricity of three players who know each other's work to such a degree to indulge in a bit of devil's advocacy. Russell's guitar work adds bare, textural scrapes and scratches, or at his most animated sounds like rainfall on a metal scrap yard. Durrant rarely approaches his instrument as a melodic device. Instead he constantly explores the extremes of timbre and pitch. Butcher may appear to be the lead voice at times, but this is due largely to the nature of his instrument as opposed to an agenda, as his humming overtones arch in between the textural din of his colleagues. Remarkably, this group has not enhanced their music electronically. Yet there are moments where the listener would swear that unadulterated acoustic instruments were incapable of bending to the will of the players in such a way." "This long standing trio maintain the virtues of classical Free Improvisation, paying attention to thin lines of sounds, barely-voiced creaks and phuts, and collective repartee. There's so much densely-packed detail and invention, most other musics suddenly seem blockish and boring in comparison. Acoustic instruments yield up the kind of textures associated with Ambient and Electronica, but real-time musicianship makes it extraordinarily tense and poignant. Staggering." "The hallmark of THE SCENIC ROUTE is quiet activity, often focused on the higher ranges of the instruments. An extraordinary example is Beyond Headlines, which begins in dog whistle territory and never really lets up. Belayed is a sustained exploration of upper registers which rarely dips into mid-range, Butcher's soprano at times having a rather oriental and bucolic feel. Throughout, the saxophonist deploys a remarkable diversity of approaches, from multiphonics and slap-tonguing, to the production of toneless passages of air. Heavy Merge has moments of tender lyricism set against frantic passages, while Buffet Balls is a set of brief but atmospheric duos. Sounds often merge so seamlessly that it's hard to tell which instrument is playing, and there's an intuitive empathy which makes for exciting risk-taking. These diverse offerings make for free improvisation of a high order." "This sax/violin/guitar trio may convene only sporadically but they are, nonetheless, one of the finest English improv groups of the last 10-15 years. This is an ascetic, astringent group, charged by a harsh and often bitter tonality which is constantly refracted through a complexly evolving group dynamic. Low-volume playing is common, as is outright silence - every so often the group will stop altogether to consider, before suddenly recommencing. Butcher is perhaps the most active of the three; Durrant and Russell's high-pitched scratching often weaves a strangulatingly fine mesh around him, out of which he struggles to squeeze his way. At times the participants seem to be almost sniping and snapping at each other, but will then easily settle into a serene state of co-existence. By turns head-scratchingly quiet and headache-inducingly loud, bewilderingly slow-moving and dizzyingly fast, this trio concocts a music that cannot be pinned down." "The players have a sure sense of flow and dynamics, moving from soft flutters to dense, piercing assemblies of chirps and squeals to loud churning climaxes. Butcher most often takes the foreground by virtue of his willingness to play fuller, more sustained sounds than his partners, but this is still thoroughly collective music. He shares Even Parker's interest in the extreme edges of saxophone sounds, but the deliberate pace at which he develops his excursions and his knack for injecting laconic micro-events are all is own. He and Durrant, who also work together as an electronic duo, show real skill in making their acoustic instruments sound like high pitched electronic tone generators. Russell might use some of Derek Bailey's techniques to wrench spiky, resonant sounds out of his box of wood. But he's more inclined to obliquely glue things together than to throw a wrench into whatever's happening, reaffirming this trio's commitment to expressing a collective whole rather than an assemble of parts. " "John Butcher (saxes), Phil Durrant (violin) and John Russell (guitar) are a free-jazz or improvisational power trio of sorts. THE SCENIC ROUTE is the latest from this daring and adventurous group. The opener, Heavy Merge commences as if three scientists were meticulously crafting an intricate Swiss watch. On this piece the musicians enact clever and cunning dialogue in workmanlike fashion. The delicate transformation of unusual sounds from common unaltered instruments seems astonishing. On Belayed, further evidence of how these gentlemen coalesce as a band is heard through unorthodox thematic development and off-centre interplay which at times is odd and surreal. The liners indicate...'All instruments used without amplification or other electronics'. The tour-de-force is the 22-minute piece titled, Climate Change. Here, Russell and Durrant pluck their stringed instruments in mechanistic fashion utilising all registers while churning out generous doses of harmonics. The feel is purposely tense or expresses uneasiness. John Butcher's amazing soprano & tenor sax work is the glue yet provides the contrast as Russell and Durrant offset Butcher's often circular or in many instances abrupt phraseology. The SCENIC ROUTE epitomises the ceaseless creative spirit and artistic invention or perhaps "reinvention" of the British Free Jazz movement. Here, three proven masters of modern music take the listener on a mystical yet brisk expedition, complete with all the peaks and valleys. Highly Recommended! * * * * "
"Three improvisers with long resumes and magnificent virtuosity. Themeless improvised music that highlights the abilities of each musician to interact with his fellows and create a seamless whole of spontaneous composition. 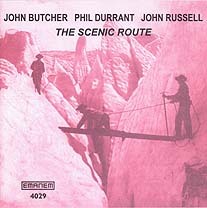 That is THE SCENIC ROUTE by John Butcher, Phil Durrant, and John Russell. The title may be derived from the unhurried nature of these 1998 performances, which bear the marks of mature craftsmanship. Although saxophonist Butcher is unafraid to employ multiphonic effects, and displays a post-Evan Parker familiarity with the uttermost reaches of his instruments' possibilities, this is not the flat-out screeching and wailing of the "free" music of cliché. Rather, this trio works in textures and moods, and works at stretching the possibilities of the instruments. All three players play percussively at various points: Butcher pops his pads (see especially Buffet Balls), Russell clangs his strings a la Derek Bailey, and Durrant streaks his bow into the cerulean stratosphere. This is often music of surpassing beauty. Around ten minutes into Heavy Merge there is a characteristic passage: Butcher begins to play a tenor line of great delicacy which soon edges, abetted by Russell, into a percussive staccato attack. Finally there is a keening wail that could come from any of the three instrumentalists, and the dramatic transformation is whole. These three players are past masters at this sort of thing, and this music ebbs and flows in and out of a great variety of such moments as it takes its course along the scenic route. Anyone who appreciates improvised music will find great treasures here. " "The SCENIC ROUTE is a three way dialogue between three master improvisers. Each man has something important to say, but each also obviously respect their fellow participants, and no one takes control at any point. At times, politeness reigns supreme, as the music quiets to a hush, with each player opening space for their companions, while staying in the background - Butcher gently blowing along with the quiet plucking of Durrant and Russell. Interplay like this is something that takes time to develop - this group formed in 1984, and though this is only the third album as a trio, they have played together as a unit as well as in other formations ever since. This disc features two concert performances from the spring of 1998, and though separated by two months, blend together on disc almost as though a single piece. All three musicians on this recording are true innovators on their instruments, and eschew traditional technique. This is not done simply from time to time for effect, but throughout as they forge an new language for themselves and their little society. While Butcher's multiphonics and circular breathing are not a wholly new concept, he has developed his own style parallel to other saxophone greats such as Evan Parker. Durrant manipulates his strings with fingers and bow, plucking and scraping into an ethereal world of sound. The most unconventional, though, is Russell, who dismisses traditional guitar mythology with an approach completely his own. At times, his sounds are so unconventional that detractors could dismiss him as being a complete amateur; his accurate timing and the precision with which his sounds fit into the whole, however, prove his remarkable talent to manipulate his instrument exactly as he desires. At this beginning of the first track, Butcher, Russell and Durrant feel the waters, gently yet forcefully establishing their individual place in the conversation, stating the various ideas they will return to occasionally, their thesis statements that hold the piece together. From this, they move in a variety of directions, both together and separately, frequently heartily agreeing with each others opinions; other adventures build to a cacophonous argument. At times, ideas seem to begin with one musician, only to be completed by another. This is the rapport of old friends reminiscing, telling stories with no beginning or ending, with everyone involved knowing where they are going, and how to get there. Listening in on this conversation borders on voyeurism, as it is a personal history being told. Listening to this disc, on first listen, I was a fascinated outsider, a new member of the clique, who wants to learn the history. As the tale-telling moves from one voice to another, I remained captivated to hear not only how the stories would end, but how they would get to that point, and what each participant would reveal about himself in the telling. With repeated listenings, though I know how story would ends, minutiae and personal inflections remain captivating. A sense of being alien remains - these are not my stories, and I can only sit and listen in wonder, always an outsider fascinated by the stories of my new acquaintances." "[This CD] finds the trio in the same resiliant form at two concerts a week apart in London and Paris. Heavy Merge offers 20 minutes of severely attractive interplay and says just about all they have to, though there is another half-hour of material in addition."